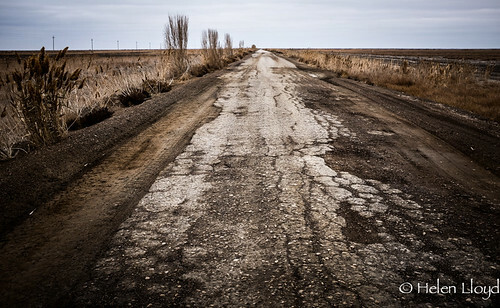 Rather than retrace the direct route to the main road via Urgench, cycled along the smaller roads for a short cut towards Nukus. Riding through small towns and farmland. Uninspiring. But I was quite happy just pootling along. No particular rush. I thought again how this countryside reminded me of Norfolk. Dusk arrived too fast. The days are short now that the winter is drawing in. And I realised I didn’t have any chocolate for the evening! That had to be rectified… When dinner is only instant noodles, a chocolate bar makes the subsequent 2-course meal seem positively gourmet. By the time I’d got chocolate and filled up my water bottles, the sun had set. The sky pink and crimson as I crossed the Amu Darya river for the last time and waved at the police by the roadside. 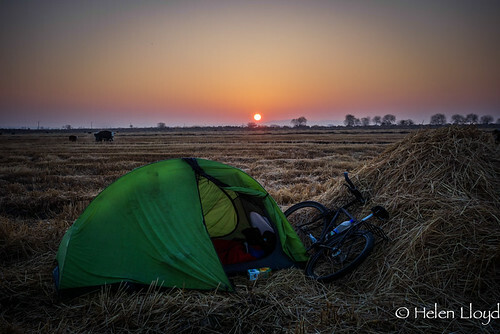 And it was almost dark when I pedalled off the road down a dirt track to search for a campspot. That was one of the last lovely nights camping out. Beautiful starry skies. Peaceful. Tent hidden behind a stack of straw in the field alongside the river. Next morning when I pushed my bike back to the track, I saw in the hazy distance a ruined hilltop fort. That looks interesting I thought. So I pedalled on further down the sandy track beside the river and eventually came to Chilpak fort. 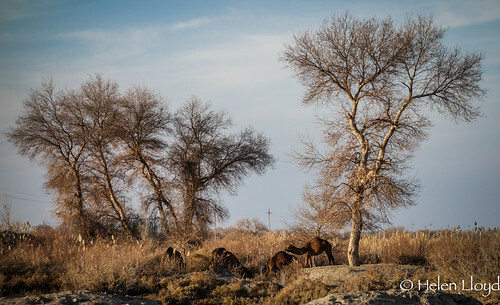 From there it was fast riding back on the main road to Nukus, where I spent the afternoon looking round the fascinating art museum and a frustrating hour in the bank trying to get cash. By the time I left, it was dusk again and I had to pedal fast out of town in search of another campspot. Not so peaceful that night – next to the train tracks. Dogs barking too. But I slept well. The road to Kungrad further along the main road was not noteworthy. Tractors pulling huge trailers squeezed full of cotton went the other way. I slip-streamed one going my way and had an easy ride. 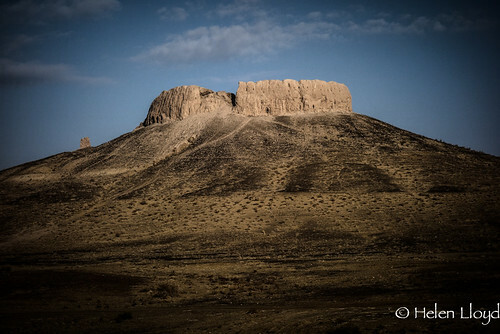 Then I took the road to Moynaq. Straight north, into the desert. You know you’re in the desert when there are camels on the roadside. And the next day it rained. 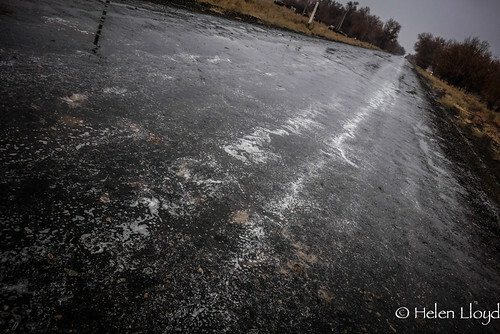 The road was covered in scummy water. I don’t care to think what awful chemicals were washing off the fields and being splashed over me as taxis rushed past. What a miserable ride. Wet and cold. So I kept my thoughts focussed on the hotel in Moynaq where I could shower and dry off and warm up. Except when I got there, there was no hot water and no heating. I shivered under the blankets as my hair dried and my feet thawed. There was nowhere for dinner either. Noodles again then. Yum! 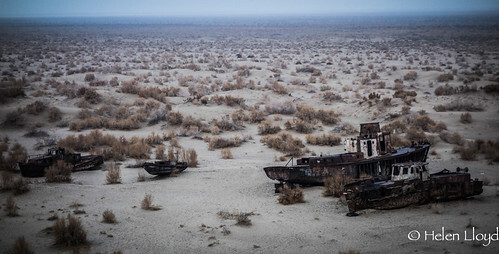 But I did get to see the rusting ships that were once used to fish on the Aral Sea. But the sea has receded and the water uninhabitable for most fish now. That’s all thanks to draining of the Amu Darya to irrigate the fields for cotton production. Probably the biggest man-made environmental disaster of the last century. My plan was to take the dirt tracks across the desert to rejoin the main road near Zhaslik, rather than return by the way I had come. But everyone I asked said it was not possible. So I simply kept asking other people until someone said it was… But I made the mistake of following their directions, rather than using my instinct and gps tracks. So I ended up at a gas compressor plant, once again drenched and cold from the relentless rain, somewhere between where the edge of the Aral Sea used to be and where it has now shrunk back to. Within an hour, I had eaten a great hot meal, had a hot shower, washed my clothes and offered a bed in my own room for the night. Everyone there was very concerned about me camping out in the desert alone. There are big packs of wolves around there – and with winter around the corner, they are getting hungry and brave. I would continue the next day. But the next day the rain started again and the dirt tracks were getting muddy. Even the trucks can’t proceed when it rains here. And now I had a stinking cold – sore throat and clogged up lungs. The forecast was just more rain and freezing nights. And when I spoke to the foreman who explained to me the route, it was further than expected. For sure, there would be no other traffic. Oh hell, why am I trying to do this? I reluctantly turned round and cycled back to Moynaq. By the time I got there I was frozen cold and completely drenched from the rain. I simply wasn’t kitted out well enough for this kind of weather. Great photos Helen, I am thinking by reading your post, that you are doing a form of ecological reportage. The sea receded …. Dress warm ,, always wear a scarf around the neck. Best way to keep the cold out. What a great adventure, and your photographs are excellent! I’m cycling around the world myself, and this looks pretty exciting! Something I’ll be sure to check out when I reach Uzbekistan.